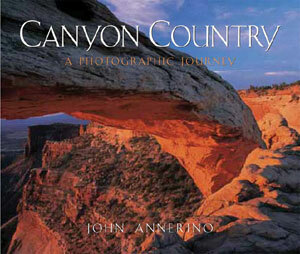 Renowned photographer and author John Annerino leads you on a riveting journey into the harsh, extraordinarily beautiful territory that is Canyon Country. Stunning photographs and fascinating commentary about such places as Canyonlands, Arches, Bryce Canyon, Capitol Reef, and Zion Canyon National Parks; Glen Canyon National Recreation Area; Grand Staircase-Escalante National Monument, and countless other sites accompany Annerino's exploration of the natural and cultural history of the region. With suspenseful storytelling and dramatic historical detail, Annerino tells of the doomed expeditions of early American pioneers, gold seekers, and uranium hunters; pays homage to the region's natural and spiritual significance to its Native American inhabitants; and recounts his personal explorations into the canyons. Canyon Country leaves a lasting impression of this awe-inspiring region, a place that has been the inspiration for centuries of myths and legends. Full-color throughout.